Annuar (left) is seen with Abdul Drahman, who is calling himself the Bersatu Hulu Rajang pro tem committee chairman. KAPIT: Parti Pribumi Bersatu Malaysia (Bersatu) seeks to sign up 500 members in the Kapit and Hulu Rajang parliamentary constituencies by the end of this month, claimed Annuar Ojit, who is calling himself the Bersatu Kapit pro tem committee chairman. The former SK Kampong Baru headmaster claimed the pro tem committees for the two constituencies are already halfway towards their target. “The response is very encouraging and within a short period, we have received some 300 applications wishing to be our members,” he told reporters. Annuar added that non-Bumiputeras can also sign up to join Bersatu. “They are the affiliate members, who can vote in the general assembly but cannot seek any position in the party,” he explained. 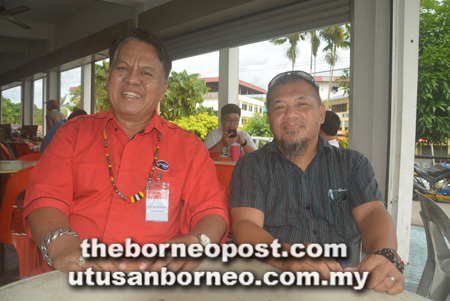 Last month, Bersatu Sarawak supporters’ spokesman Affendi Jeman had said the party hopes to sign up 50,000 members across Sarawak by the year’s end. He claimed the group had received 19,868 membership applications.